Poetry has always found a way to inspire me. I read it on social media, little book excerpts, framed quotations on walls. More often than not, poems are just one of the things that kind of lure me in. When I discovered Rupi Kaur on Instagram, I noticed that a) her feed was very pretty and b) she had a very fascinating style of writing that made me want to go deeper and deeper into the poems she wrote. So when I found out she actually had a book, I made a promise to myself to buy and read it. Earlier this year, I finally got myself a copy, and I quickly finished reading all of it. 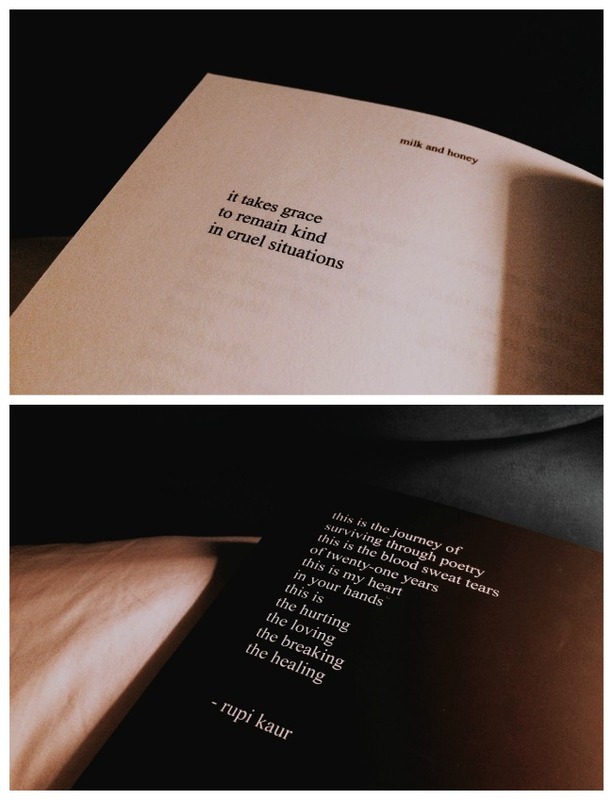 For those of you who don't know, Milk and Honey is a collection of poems written by Rupi Kaur. The book's divided into four main chapters that will feel a lot like she's taking you through the different phases of her journey: the hurting, the loving, the breaking, and the healing. I think it's important to note that this book covers a wide spectrum of emotion, from falling in love to heartbreak, but it also has a few notes on things like sexual assault and physical abuse. With that said, I should mention that this might become trigger warnings for some. Before buying this, I'd never owned any poetry book, so when I first got this, I was actually pretty stoked. I think it's a very different approach to what is considered art as well, and I like that Rupi Kaur pours her heart and soul into her writing. You just kind of take it with you and feel it as you read the book. The art featured alongside some of the poems were quite fascinating as well. However, I'll be honest, as much respect I have for Rupi Kaur and her poetry, at times, I did find the book a little cliché. I liked a lot of things about it, but I understand how some would bash on this book saying "it isn't poetry". Upon finishing it (perhaps a little too quickly), I'd already marked all the pages that I liked, but I just don't feel like it made an ~*iMpacT*~ on a deeper level for me personally, which was kind of a letdown. Some of the paragraphs or poems are very heartfelt and beautiful, so much so that it made me admire the book a lot more. But then you flip to the next page and you see that she'd basically taken up one whole page for a tiny poem consisting of three lines. I felt that these pages carried strong messages, sure, but writing down a quote (even if it's a lovely one) and then just breaking it down into three to four lines for the concept of being ~*aesthetic*~ isn't very ideal. For Tumblr, sure, but not for a published, bestselling book. Aside from that, I think it's an interesting book. I mean, the poet has definitely come a long way throughout her life, and is very brave for opening up so vulnerably in this book. Although I probably was too excited at the thought of having my "first poetry book" that I might have overestimated this piece. I did hear that Rupi Kaur is working on a second book, so I just hope that it'll be in some ways better. Meaning that it'll have more words, and more meaning within these words, and less of a blank space. It's just sad because if you're already given such a platform and you're already a very talented, well-known writer, you should put in as much energy as you can into your art, and I think this book only showcased a fraction of what Rupi Kaur is capable of. I'm expecting a lot more from her. And that is the end of my book review! It's been a while since my last book review so I truly hope this gave a bit more insight! 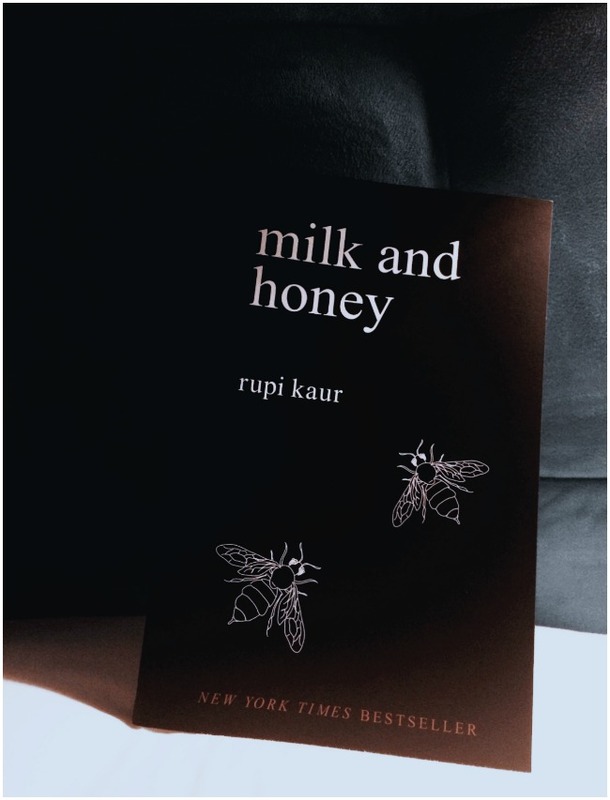 Do you have a copy of Milk and Honey? What do you think of it? So lucky to purchase this book on an Aksara discount! So worthy to read!